Good oral hygiene goes far beyond the mouth. For example, if gum bacteria (the same bad boys that cause dental plaque) find their way into the bloodstream, they can cause clots that may lead to heart disease, or even to a heart attack. This is the recent subject of a dental study in the UK where they found that indeed, if plaque makes its way into your blood, clots might form, resulting in heart problems. In fact, understanding the consequences of inadequate oral hygiene is just as essential to good health as are diet, exercise, lowered cholesterol and blood pressure le vels. When we are not careful to brush and floss regularly, bacteria (usually Streptococcus) begin building up plaque on our teeth. 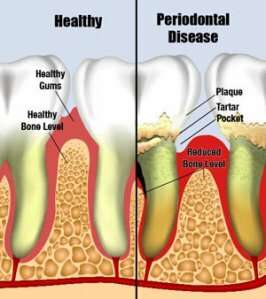 Eventually, the plaque irritates the gums; they become sore and may begin to bleed, allowing the bacteria direct access to the bloodstream. That's when the real trouble begins – not just the discomfort of plaque-coated teeth and sore gums, but the strategy of the bacteria as they commandeer blood platelets: the platelets bind to one another in clumps which all too soon turn into blood clots. Unfortunately, the strategy is so successful that, hidden by the platelet clumps, the bacteria can avoid detection by both the body's immune system and antibiotics. The unhappy ending may be not just small blood clots, but endocarditis (growths on the heart valves) and inflamed blood vessels that may block blood flow to the heart and brain. It's a worst-case scenario! Because cardiovascular disease is the number one killer in developed nations worldwide, the potential impact of practicing and sustaining oral hygiene is basic training as part of a healthy lifestyle. And the implications of the new study may lead to treatments for the disease itself, as well as confirming one of the best ways to prevent it. For more information, you can visit our Web site: http://www.nycsmiledesign.com (Hygiene and Periodontal Treatments). You'll find some clear and simple procedures to keep your teeth and gums clean and healthy, and some of the treatments we provide to help you be sure of long-term maintenance.